PWC’s 2018 Global Consumer Insights Survey(PDF) reports that the number of customers shopping in bricks and mortar stores has risen from a low of 36 per cent in 2015 to 44 per cent in 2018. And this isn’t grocery shopping, this is daily or weekly shopping for items other than groceries. I don’t know about you but that kind of blew me away. We hear so much about store closures, struggling retailers and so forth. And yet the fact is that people are still shopping in physical stores. And not only that, it is an increasing trend. So much for the death of the high street. A key benefit of bricks and mortar stores is the ability for the customer to see the product first hand. 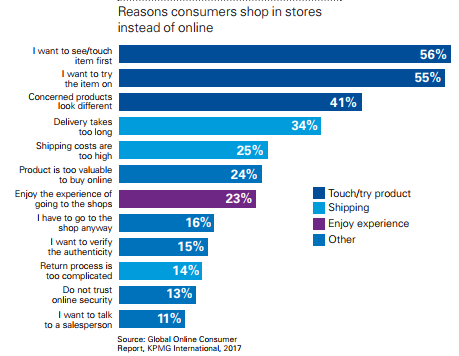 KPMG’s Global Online Consumer Report found that people wishing to see and/or touch an item first before making a purchase was the number one reason consumers gave for choosing to shop in-store rather than online (56 per cent). Closely followed by 55 per cent of consumers wishing to try an item on before buying. Online reviews have their place but you’ll never be sure the jeans fit until you try them on. And whilst I really love the convenience of online shopping, I really resent the inconvenience of the times when I need to return items, however simple an online retailer may try to make the process. It is just an annoying thing to have to find the time to do, and all the lovely endorphins my brain got when I pressed the ‘buy now’ button soon become a dim and distant memory. Perhaps, in part, the rise of in-store shopping is a case of humans simply being creatures of habit; we are used to doing our shopping in-store, it’s just how we have always done it. 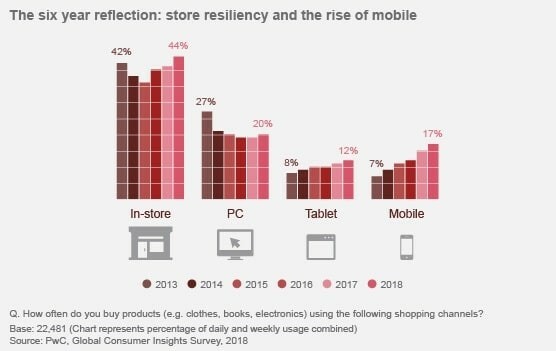 Yet the PWC report also shows how in terms of online shopping behaviour there has been a steady drop in the use of a personal computer (PC) to make purchases and a significant rise of mobile phones. Over a six-year period, purchases made by PC has fallen from 27 per cent to 20 per cent, whilst mobile commerce has more than doubled from 7 per cent to 17 per cent in the same timeframe. So it isn’t a case that people can’t or won’t change their shopping behaviour, there is active choice behind the stats. And in actual fact, the surprising truth is that millennials actually shop more frequently in-store than older generations. So there is definitely something more going on that it’s just how we’ve always done it. Shoppers’ willingness to use their smartphone provides an opportunity for bricks and mortar stores. ‘Order online, pick up in store’ is a simple way for traditional retailers to retain their share of consumer spend. But there are further opportunities. Shoppers in-store are likely to have their smartphone with them, displays using QR codes to provide special discounts or links to online product demonstrations help encourage in-store purchases. Shoppers are looking for a personalised shopping journey and this means joining online and in-store together, through personalised offers linked to online searches and social media activity, and such like. Some stores are embracing virtual reality technology; IKEA for example, has an app that provides customers with the chance to see virtually what the furniture will look like in their own home before making a purchase. It’s about finding ways to embrace customers desire to use technology whilst at the same time drawing them to the store to make the purchase. What is also interesting is that 53 per cent of shoppers report that face-to-face interaction with knowledgeable, helpful salespeople gives them satisfaction. This compares to 40 per cent for personalised offers, so whilst technology plays a big part in the development of shopper behaviour it goes to show that we shouldn’t underestimate the value of good old-fashioned customer service either. Technology has certainly changed the face of the retail market. The way we shop, the way we research products, our expectations – shoppers and the shopping experience have changed significantly. But what we are also seeing is that shoppers continue to want bricks and mortar stores, and traditional retail still has an important role to play. It's always good to test assumptions! As well as looking backwards we have tried to look forwards, read our nine predictions for UK retail in 2019 What do you think? 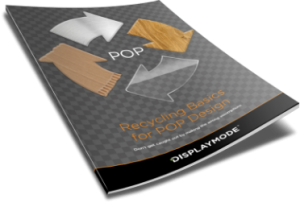 GET MORE SALES FROM YOUR FOOTFALL!